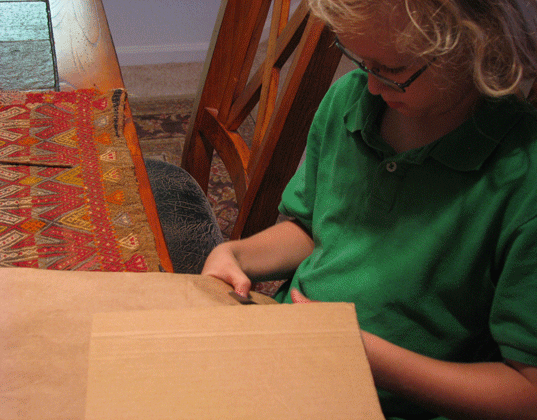 Cut two equally sized square pieces from a cardboard box to use as your front and back cover. You can make your book as big or as small as you wish. 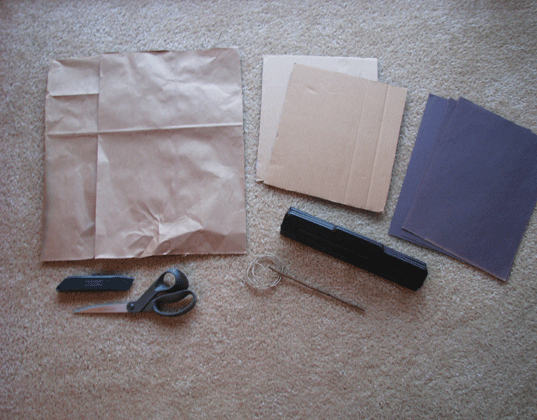 Then if necessary, use natural glue and a brown paper bag to cover any words or graphics that may be printed on the cardboard. Cut the scrap paper to fit inside of the front and back cover for your journal’s pages. Then, punch holes in the paper and the front and back cover. 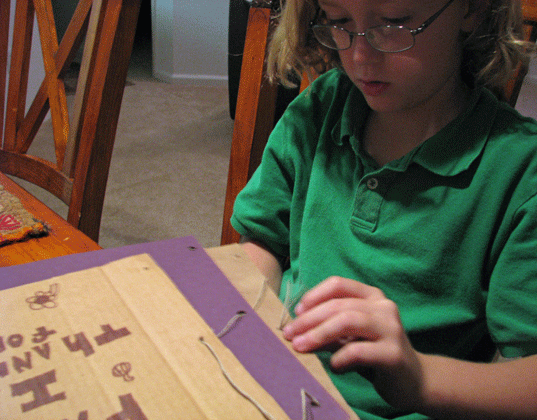 Use twine to secure the front and back cover to the inside paper. Once it was tied securely, we weaved a small twig into the binding for a nice finishing touch. 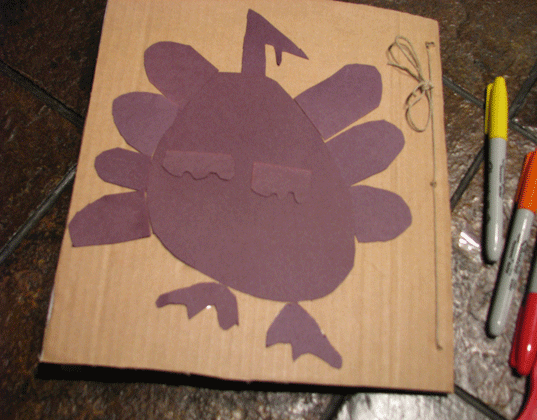 Let your child use markers, crayons or colored pencils and scrap pieces of paper to design the front and back cover. My son found this to be the best part of the project — my favorite part was when he wrote our names at the bottom. Inside, label each page with headings for each member of your family: “Mommy is thankful for….,” “Daddy is thankful for….,” etc. 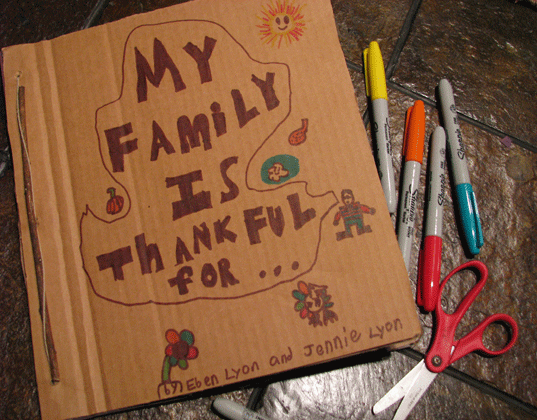 Encourage your child to ask each family member what they are thankful for and record it in the Thanksgiving family gratitude journal. Now for the fun part: Have you child get in touch with each family member, or ask him to find a moment to chat with everyone in the family before Thanksgiving dinner is served. Each family member should express what they’re grateful for this year and your child can record their answers. How does your family share their gratitude on Thanksgiving day? what a wonderful idea! and a great way to get kids involved in the whole process like that! we always talk about what we are thankful for from the past year and what we hope to be thankful for in the coming year after we eat dinner on Thanksgiving day. Cut the scrap paper to fit inside of the front and back cover for your journal's pages. Then, punch holes in the paper and the front and back cover. 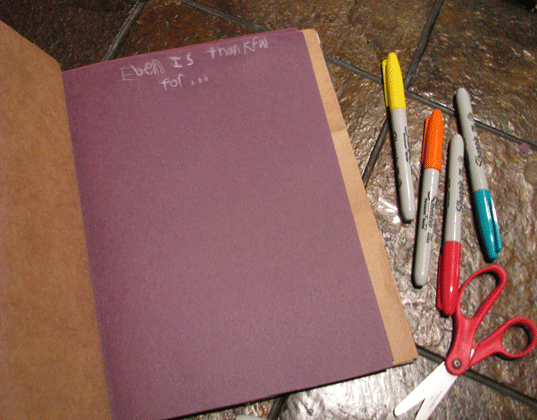 Use twine to secure the front and back cover to the inside paper. Once it was tied securely, we weaved a small twig into the binding for a nice finishing touch. 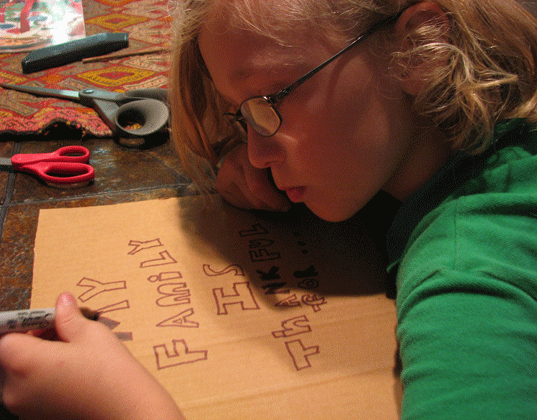 Let your child use markers, crayons or colored pencils and scrap pieces of paper to design the front and back cover. My son found this to be the best part of the project -- my favorite part was when he wrote our names at the bottom. Inside, label each page with headings for each member of your family: "Mommy is thankful for....," "Daddy is thankful for....," etc. Encourage your child to ask each family member what they are thankful for and record it in the Thanksgiving family gratitude journal. Now for the fun part: Have you child get in touch with each family member, or ask him to find a moment to chat with everyone in the family before Thanksgiving dinner is served. Each family member should express what they're grateful for this year and your child can record their answers.